VRP has just released “Torsional” Carbon Arm Inserts for the Mugen MBX8. 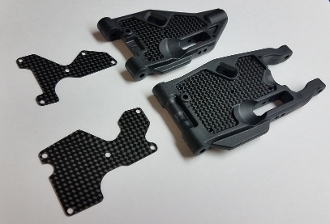 These are much different than your typical carbon arm inserts. Rather than flexing torsionally, they flex length wise (from hinge pin to hinge pin). This will help the suspension arm flex correctly; keep them from twisting under load when accelerating/decelerating , yet allow them to flex with the ‘squat’ of the chassis. Overall, they will give you more traction and a consistent feel compared to regular carbon or plastic inserts.